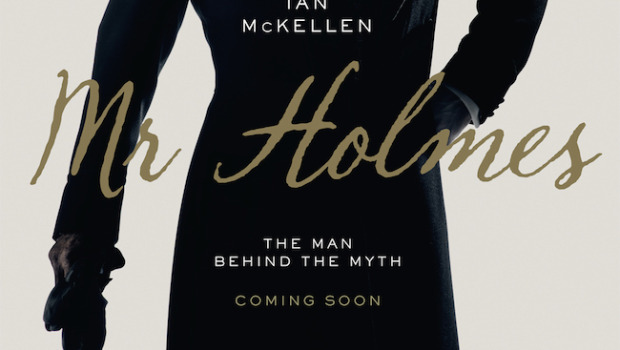 Seemingly a little lost amidst the continuing hoo-ha surrounding Jurassic World and the transition from TV to film of Entourage, it may have slipped your notice that Mr. Holmes was also available in cinemas this past weekend. Taking up the role of the great detective is Sir Ian McKellen, reuniting with his Gods & Monsters director Bill Condon to tell the story of a 93-year-old Sherlock Homes, in self-imposed exile in Dover for 30 years, trying to come to terms with the events of his final case, the one which forced him into exile, the details of which he can’t remember. 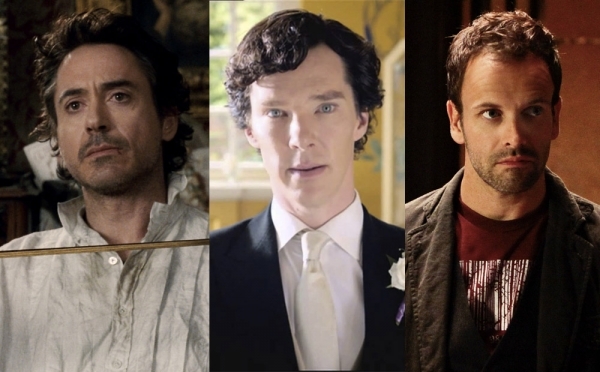 Sherlock Holmes is not a character unfamiliar to cinematic adaptation. His first appearance is in the thirty-second-long 1900 comedic short Sherlock Holmes Baffled, which could just as easily be titled Audience Baffled given how little sense it makes. 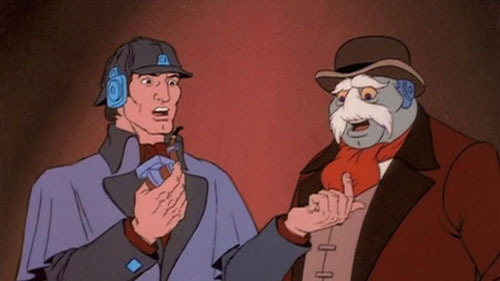 Over the interim 115 years, Holmes has been portrayed by around 80 actors in over 100 adaptations to both film and television, ranging from the classic series with Basil Rathbone in the role to the animated series Sherlock Holmes in the 22nd Century in which Holmes, awakened from being frozen a la Captain America, fights crime alongside a robot whose AI is programmed with the personality of Dr. Watson. Yeah, this was a thing. More recently, we have seen three more modernised takes on the classic sleuth. In 2009 and 2011, director Guy Ritchie paired Robert Downey Jr as Holmes and Jude Law as Watson for a pair of modern-style action films in a period setting. They’re very good fun, driven largely by Downey Jr and Law’s winning performances. In 2012, American TV network CBS launched Elementary, a contemporary series set in New York, starring Johnny Lee Miller as Holmes and Lucy Liu as Dr. Joan Watson. I’ve not seen any of it, but it’s due to begin its fourth series in September and I hear good things about the first three. This was launched after a failed attempt by CBS to secure the rights to remake the 2010 BBC series Sherlock, the most popular take on the character for a number of years. 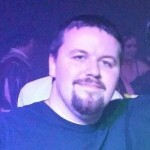 Comprising three series of three 90-minute episodes, this brain child of producers Steven Moffat and Mark Gatiss, Sherlock launched stars Benedict Cumberbatch and Martin Freeman to international stardom, and is largely the subject of mass speculation when it’s off air and mass wailing and gnashing of teeth when it’s on. It’s very good. None of these have anything to do with Mr. Holmes. 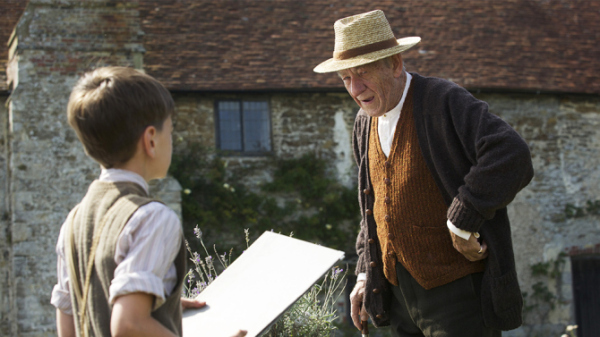 Mr. Holmes is in fact about as far-removed from the flash and panache of the other more modern takes as it’s possible to be. Adapted from the novel A Slight Trick of the Mind by Mitch Cullin, what we have here instead is a tender, thoughtful meditation on getting old and becoming enfeebled, and magnifying that frustration through the lens of fiction’s most famous detective slowly losing his greatest gift. It’s also a playful deconstruction of certain aspects of the mythology of Sherlock Holmes, particularly in the beautifully meta-textual scene in which Holmes goes to see a film adaptation of one of Watson’s stories about the fictionalised version of himself. In a brilliant touch, the actor playing the matinee version of Sherlock Holmes is Nicholas Rowe, who first came to prominence in 1985’s Young Sherlock Holmes, playing… well, Sherlock Holmes. The film flashes back and forth between three time periods; two deal with Holmes at 93 in 1947, dealing with his failing memory and the guilt he can’t place, on both a trip to Japan in search of a plant whose properties he believes might aid his affliction, in the company of a botanist and avid reader of his stories (Hiroyuki Sanada), and in the aftermath of that trip at his home in Dover with his housekeeper Mrs. Munro (Laura Linney) and her son Roger (Milo Parker), and the third nearly thirty years earlier, dealing with Holmes’ last case, a husband concerned about the frequent disappearances of his wife, grief-stricken after two miscarriages. The Japan and younger Holmes storylines are woven in as flashback, as the present-day Holmes slowly begins to remember them. Linney, Parker and Sanada are the main supporting cast of the film, along with Patrick Kennedy and Hattie Morahan as the young married couple, and they all do sterling work. Laura Linney and Hiroyuki Sanada are long-time favourites of mine, and as good value as ever, whilst newcomer Milo Parker is sensational, ten years old and holding his own with old pros like Linney and McKellen. The heart and soul of the piece is Sir Ian McKellen, though, and he’s truly magnificent. A spry 76 in real life, he’s utterly convincing both as the man in his mid-sixties and still in full control of his faculties and particularly the enfeebled, grumpy old man with a twinkle in his eye and a way with children in the 1947 segments. The excellent make-up work helps, but we could have separated the two periods in Holmes’ life through McKellen’s performance alone. He’s one of this country’s finest actors, and this is one of the best performances I’ve ever seen him give. It’s absolutely stellar work. What a delight, also, to see Bill Condon back on form. After cutting his teeth on a few TV movies and the underrated Candyman: Farewell to the Flesh, Condon’s never been massively prolific. 1998’s Gods and Monsters was eventually followed in 2004 by Kinsey, and then 2006’s Dreamgirls. Since then, he’s made The Twilight Saga: Breaking Dawn Parts 1 & 2 and The Fifth Estate. I can’t speak to the merits of his forays into Twilight, having avoided that tosh like the plague, but The Fifth Estate is an unmitigated disaster, one of the worst films of its year. Condon is a very fine filmmaker, and it’s great to see him producing good work again. I was really taken with Mr. Holmes. It’s brilliantly directed, beautifully acted, and Carter Burwell’s score is gorgeous. It’s a thoughtful film, with a twinkle in its eye; sombre without being overbearing, playful without ever feeling slight. It’s a fine alternative to the more modern takes on the great detective, with potentially a career-best performance from Sir Ian McKellen. I can’t see it lasting long in cinemas in the midst of blockbuster season, particularly given the apparent staying power of Jurassic World and the imminent release of Minions, but I do urge you to go and check it out while it’s still on.